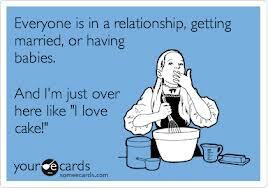 All my friends are geting married or having babies and I’m just eating cake. So I have noticed lately that all my friends are starting new relationships, getting engaged/married or having kids. Last year my sister got married, I have had my cousin and a really good friend of mine get engaged, 3 good friends are currently pregnant and another few are planning on trying soon. Not to mention heaps of single friends are in relationships. And I’m just sitting here eating cake. As you all know I am a single mum. I have my son 100% of the time and in the past few years I have had the people who I used to have look after my son once a month to just give me some time to be myself move away. So I don’t get out much. In fact the only time I get out is when there is a major event on and I book a sitter at least a month in advance. I’m happily single. Most of the time. I have my moments when it would be nice to have someone to cuddle up to in bed who doesn’t kick or sleep sideways that I can cuddle up to. I would love to have my special day and get all dressed up and be pretty and cry and be in love. My son would love a baby brother or sister and asks me quite often if he can have one. But in saying that I have been a single mum for almost 5 years now. I have dated a couple of times. nothing serious though. The idea of changing the way that I do things is scary. My son has had me to himself for the last 5 years. It would be a massive change for him to have someone come into our life and have to share his mum. To be honest I really don’t want to have to do that to him. I have gotten to the point that I know my son will never really have someone who he can call dad. I have had friends who are lucky and have met someone while their child is still young so they know their partner as dad. It does make me sad. But there isn’t much I can do about it. I foray into online dating every now and again. But in all honesty I am as happy as I am going to get. I have a beautiful son who I love and cake for and great friends for when I get the chance to have a night off from being a mum. So for now that will do and I will just sit here and eat my cake while everyone else in my life moves forward to the next chapter of their life.